This year we asked Pooh Bear what costume he would like to wear for the preschool Halloween parade? We should have known the answer it was obvious. 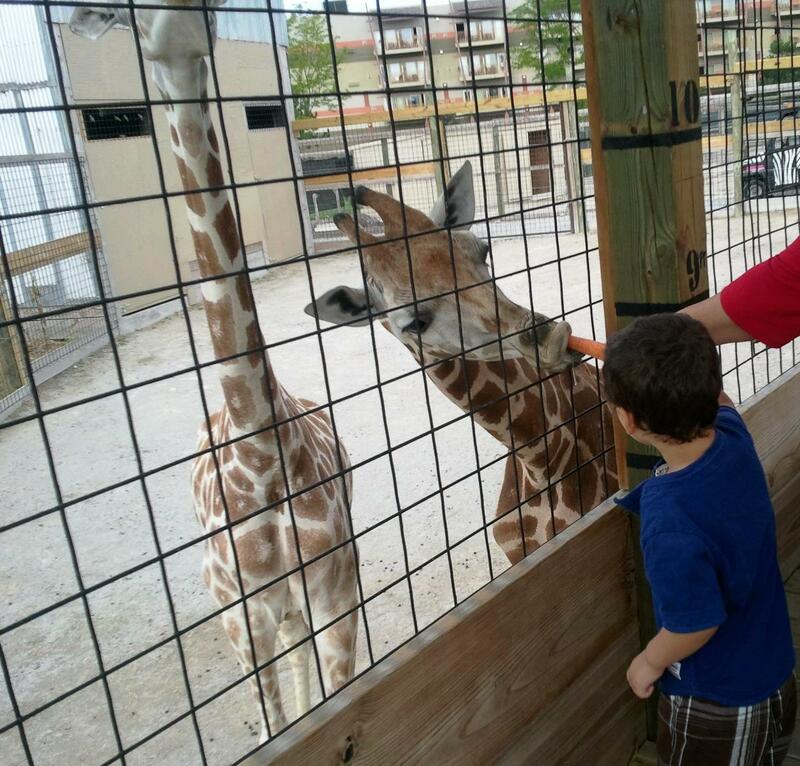 He seriously said "Mom, I want to be a giraffe with a tall neck!" Not a super hero, nor a cartoon character, monster, or dinosaur. Just a giraffe with a tall neck! This is Pooh Bear Feeding his favorite animal a carrot! Can you see why he wants to be a giraffe? Thanks to Supercenter for costumes for allowing me to review this awesome giraffe costume. Do you see how tall he is standing. He wants to be tall just like a real giraffe! The costume is made in 100% polyester fabric. It has a soft plush feel. I expect it will be nice and warm on Halloween. Pooh Bear lives in the north and it does get cold by the end of October so this will be great to keep him warm. The mittens and feet are attached. The mittens have an opening so a child can take their hands out or keep them in. The feet cover the shoes but have no bottom. There is a Velcro attachment to attach to the shoes. This should prevent tripping over the feet. The hood shaped head is not attached. The chin strap has a Velcro closure. I have looked over all the seams and the workmanship in this costume is of high quality. The size we are reviewing is a 2t-4t. Pooh Bear weighs 32lbs and is about 45 inches tall. Yes, he is tall for a 2 1/2 year old. The costume fits perfectly as you can see in the photo. I like to have lots of costumes around for the grandchildren to play dress up. I like to encourage imaginative play. Buying costumes at discount prices makes it even more fun for grandma. If your grandchild needs a costume the Costume Super Center is the place to visit. Their selection is super and I am sure you will find a high quality costume at a fantastic price. For a limited time you can take an extra 15% off on costumes $30 or more. Use the code Ghostly. Follow Costume SuperCenter on twitter to keep up with all the new costume happenings. Do you play dress up with your children Or grandchildren? What was your favorite costume when you were a child? 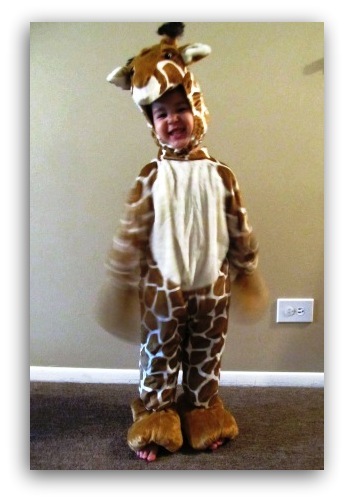 What a cutie pie "Giraffe"
Our grandchildren have ALL loved playing dress up. for a while there, we were not sure if we were ever going to get our second grandson to pull off his spider man suit. 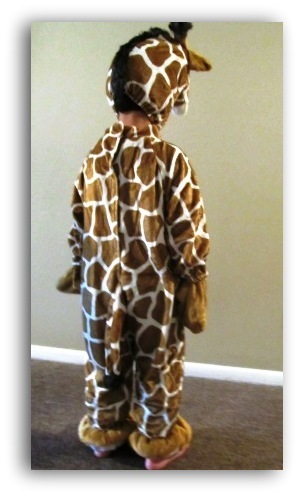 It took us about three or four months to convince him that he couldn't wear this suit to kindergarten!! What fun!! I love it and I can tell that you are a cool grandma!! we had the lion.....the costume definitely got its moneys worth!! What a sweet costume. I think it is adoreable. Headed over to check out the rest of their costumes. 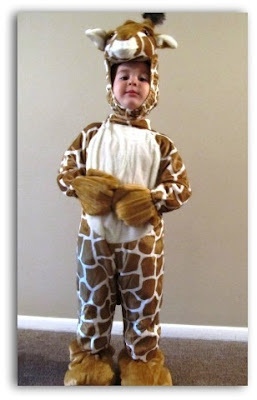 Like the picture of the real giraffe too! !